From October 1–31, NYC’s apexart will accept submissions for its Unsolicited Proposal Program, which welcomes exhibition proposals from anyone, anywhere. No prior curatorial experience is necessary, as the program is geared to create an opportunity for individuals at all career stages to organize group exhibitions focused on strong ideas. 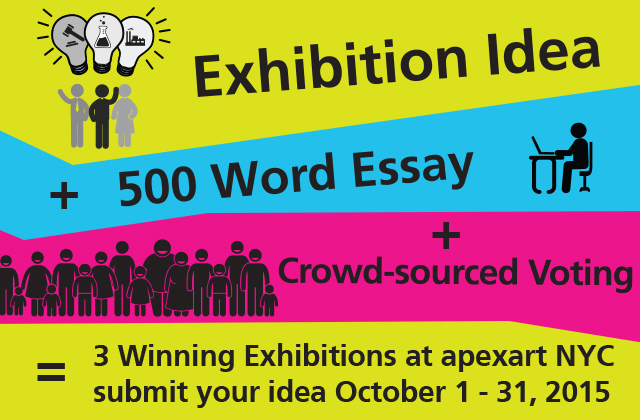 Submissions consist of up to 500 words of text. No images or links accepted, no confirmed artists necessary, no resumes or supporting materials will be considered. WHY: apexart wants projects to be judged by the strength of their ideas alone, not by familiar names or someone’s past accomplishments. Qualifying submissions are anonymized and presented in random order to an international jury of over 150 individuals who come from a variety of professional backgrounds. WHY: Rather than convene a small, elite panel to review hundreds of ideas, apexart feels that a large jury is better fit to evaluate a subset of proposals. apexart wants its programming to be compelling both to its established followers and to a wider audience with diverse interests, and it assembles the UPP jury accordingly. No experience is necessary to participate in the jury. A custom-made computer script aggregates the votes and determines which three proposals receive the highest ratings. apexart does not affect the results. WHY: apexart prioritizes the use of democratic processes to determine its programming. Whatever the jury finds most interesting will be reflected in the upcoming exhibition season. Each of the three winning proposals receives financial and administrative support necessary to mount an exhibition in apexart’s Manhattan space. WHY: Because curators and artists deserve the opportunity to effectively present their ideas and be paid for their work! To submit an exhibition proposal, visit apexart.org/unsolicited beginning October 1.